On the Old Town Island, but steps away from downtown Dubai, the Palace Old Town Hotel has a very special atmosphere. This palatial, but serene resort has 242 rooms, including 81 suites. All the accommodation has balconies, with views of either the magnificent Dubai Fountain, Burj Lake, or Old Town Island. The Spa is an exclusive retreat to thoroughly rejuvenate and refresh your mind and body, featuring Oriental treatments in a unique Arabically-styled setting. With wonderful views of the Burj Khalifa Lake, the spa has six private treatment rooms, two oriental bathhouses with Hammamm tables, sauna, jacuzzis and plenty of room to relax. The Spa has been recognised with awards as recently as 2013. For a more active time, head for the adjacent fully-equipped fitness centre, with its outdoor pool, and personal trainers if you need them. If business is your reason for being in Dubai, the hotel has all you might wish for. A Business Centre is equipped with all the latest communication and other technological support you require, including computers and secretarial services, all open from early to midnight. From small business meetings of a dozen people, right up to glittering events of 400 in the large ballroom, there are plenty of options to organise something special. The elegant and very refined meeting spaces have separate entrances and all the modern facilities you might demand. The true, spectacular highlight for any get-together is the Palace rooftop. Seven delicious options for eating and drinking at the Palace Hotel include cuisine from Argentina, Arabian, Thai, and even an English ‘High Tea’. 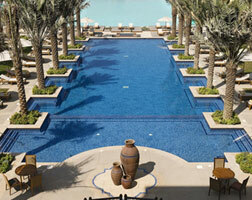 Outdoors, you can relax beside the swimming pool, and find some peace and shade inside the Arabian tents at poolside.